Enjoy a day out to visit Paris and its must-see sights like the Latin Quarter, Notre Dame Cathedral, Montmartre and the Louvre Museum. The morning is devoted to the historic neighborhoods of Paris with a city tour in our air-conditioned bus, commented by your guide. Discover the Place de la Bastille, a symbolic spot of the French Revolution. Pass through the Marais, a former marshland that became the dwelling place of the Parisian nobility. The tour continues through the heart of the Latin Quarter with its vibrant student life, where you can also see the Collège de France and the Sorbonne University. The Latin Quarter is also home to the Pantheon where great figures of French history are honored, as well as the beautiful Luxembourg garden. The tour goes on to the Saint-Germain-des-Prés neighborhood with its many luxury stores, the Café de Flore and the Café les Deux Magots. You will then be dropped off near the Île de la Cité to visit the Notre Dame Cathedral. Behold the Gothic architecture of this monument with its spires and famous gargoyles, while listening to the comments of your guide outside the building. Enter the building for a guided tour. You will also get a chance to admire the superb stained-glass and rose windows. The guide will then take you to the banks of the Seine to board the Batobus river shuttle which will bring you back near our PARISCityVISION office. You will have about 30 minutes free to have lunch in the neighborhood. Be back at our office at 1.30 p.m. for the afternoon excursion to Montmartre and the Louvre Museum. Board our tour bus that will take you straight to Montmartre. At the Anvers metro station, you will take the cable car up to the top of the hill. Your guide will tell you a bit about the neighborhood, then give you some free time to wander about and discover the area on your own. You will see the Place du Tertre where Vincent van Gogh lived and where Renoir had his studio. Nowadays, the square is an outdoor exhibition space for many portrait and landscape painters and cartoonists. 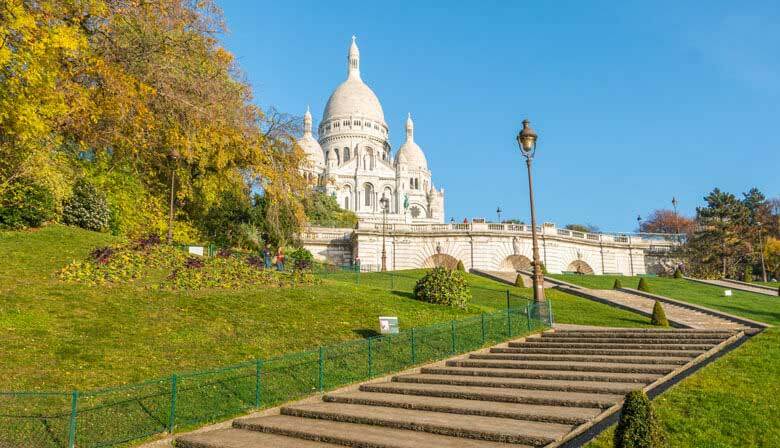 Don’t miss a visit to the Sacré-Coeur Basilica in Montmartre, with its Roman and Byzantine features. The guide will meet you again to take the cable car down the slope and take a bus to the Louvre Museum. On a guided tour of about 1 hour you will see the main artworks of the Louvre: the Venus of Milo statue representing the goddess Aphrodite, the impressive painting of The Wedding at Cana by Paul Veronese, the Coronation of Napoleon illustrating the emperor’s crowning in the Paris Notre Dame Cathedral, and Leonardo da Vinci’s famous Mona Lisa which is the most visited work in the Museum. The tour ends at the Louvre Museum at around 6:15 p.m. (except on a Monday, when it starts at the Louvre Museum and ends at Montmartre, in which case you will return to our office by bus). The afternoon tour of Montmarte and the Louvre was outstanding. Our tour guide really took care of us and had so much information that we would not have had otherwise. Very knowledgeable and entertaining guides. Excellent tour guide. Easy to schedule the tour. the tour was well organized for both Paris city tour and Notre Dame; as well as Louvre Museum skip the line. Our guide Leonor is nice and Male guide (forgot the name) was funny & entertaining. Only thing Apris City Vision has to improve is the check in process at their office which only has 3-4 people working & huge line of tourist waiting. Was a very good tour, and I had a very knowledgeable guide, I wish I could remember his name!